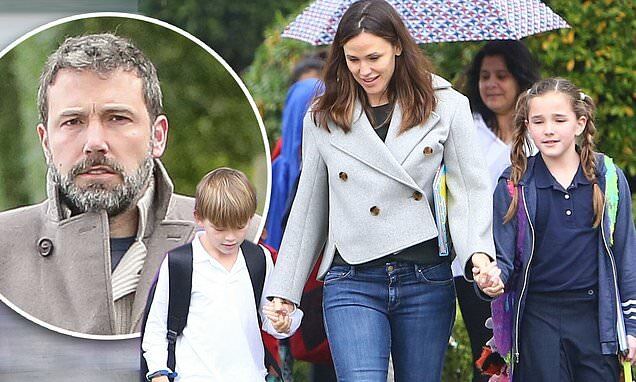 Jennifer Garner was on the school run Wednesday and did her best to try and prevent her children from getting too wet on what was a rainy day in Los Angeles. The actress, 46, went without a coat or umbrella and held hands with son Samuel, six, and daughter Seraphina, 10, as she walked them to her car. And once they got to the vehicle, she helped her youngest avoid the water rushing down the sides of the street by lifting him up and placing him inside. The endeavor was successful but not without peril. After getting Samuel into the back seat, Jen slipped and almost fell, saving herself by holding onto the car door but not before getting her own feet wet in the running water. Still, the Camping star kept her cool and even laughed at the situation. Things were easier with Seraphina who was able to step off the curb straight into the car.